Ponchos are one of the fashion world's most versatile items. They can be intimidating since they are basically just a piece of fabric and may be unflattering or appear too casual. However, this oversized knitted poncho shawls super cozy and stylish all at once. The acrylic fabric will keep you dry and warm on a rainy day while its stripes and fringes design will keep you looking chic despite the cool weather. Who says fashion and function can't be one and the same? You can still don this poncho on a warm weather. Pair it with short skirts or shorts with a wedge sandal and a cute hat and you're ready to feel and look good on a sunny day. A poncho that's about 40in long is perfect for experimenting with different styles. You can layer a poncho with a skirt or shorts with tights and it will look super chic and cute! You can even wear a belted poncho with a maxi skirt for comfort in a cool day. Acrylic is a synthetic fabric that was developed to substitute wool. It is known for its ease of care and durability. Aside from this, other benefits of this material include easy cleaning, soft, mildew and insect resistant, moisture wicking and quick to dry, resistant to soil and oil, resistant to fading, color fast, and resistant to shrinkage and wrinkling. As we maintain high quality products, our company also maintains high standards when it comes to customer service. We see to it you get the best at everything that we offer as evidenced by our 90-day full warranty on our product's quality and material. 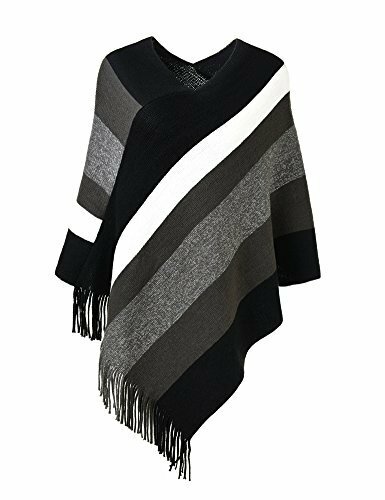 Get your very own Women's Oversized Knitted Poncho Shawl by simply clicking "Add to Cart". ABOUT FERAND - We are a fashion brand with a reputation for high quality, wide range products. We team up with professional fashion designers whose taste for style delivers the best trends to our customers worldwide. ELEGANT WITHOUT THE DISCOMFORT - This stylish poncho is made of 100% acrylic, and lightweight only 0.60 lb / 280g. It gives enough warmth and comfort in a cold day while keeping your look chic and feminine. The best part is it provides warmth without making you look bulky. BRINGS OUT YOUR INNER CREATIVE - With dimensions of 39.3 in x 35.4 in, you can be creative with this poncho. You can wear it as a wrap-around skirt, a fashionable shawl to give length to your upper body, or even a tube top to show off your neck and arms. CASUAL AND SOPHISTICATED - Whether you choose to pair it with regular shirt and pants for a casual walk in the park or wear it in a corporate meeting, this poncho is guaranteed to add style and intricacy to your outfit. CONTENT OF THE PACKAGE - 1 women's elegant stripped poncho top, and a special gift package containing a custom velvet bag, a gift card, a 365-day warranty card and friendly customer service. If you have any questions about this product by Ferand, contact us by completing and submitting the form below. If you are looking for a specif part number, please include it with your message.